Softcover, 8 1/2 in. x 11 in. 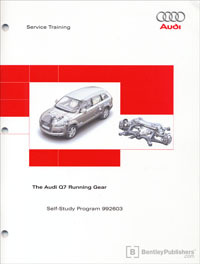 Audi Self Study Programs are designed to help the Audi dealership technician prepare for intensive factory training classes. This book provides introductory information regarding the introduction of new features, designs, and functions. Audi Training Literature is not a Repair Manual. For maintenance and repair work, always refer to the current technical literature. This technical training is based on information available at the time of its original publication and assumes that repair work will be performed in a dealership by a qualified service technician. Audi is constantly updating its automotive systems and designs; therefore, this booklet may not cover components or systems that have changed over the course of the vehicle's production, and will not apply to vehicles produced after its publication date. It provides conceptual background for the professional automotive technician rather than specific service instructions. Audi Service Training literature will be most useful for those seeking a better conceptual understanding of Audi's innovative design and engineering. While it is not for vehicle repair, it is more technical than most sales literature, and it provides a useful theoretical background for using repair manuals.